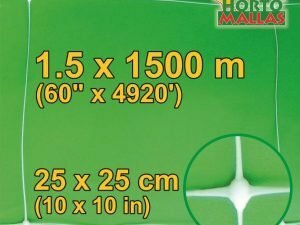 What is the appropriate Trellising System for my Field? 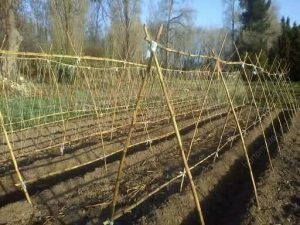 Using individual posts and or bamboo sticks fastened together in order to form a structure where vegetable plants will be trained above the ground is the most ancient form of trellising and training orchard plants. The problem is time, how long does it take to create such a structure and costs, how much does all this materials costs (and if it requires special forestry permits in order to harvest large amounts of wooden material). Also phytosanity is a question to keep in mind as insects, bacterias, fungi etc can take refuge among the cracks of these sticks and create larger problems later on. 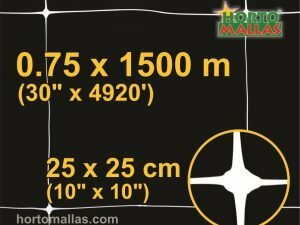 Here a comparison between raffia twine and HORTOMALLAS trellis net, which one would you use in your field? 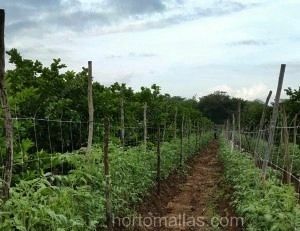 Raffia twine is the traditional trellising system used in professional agriculture, at first it was made our of yute or henequen, and now it is available in a range of polymers. Raffia is very expensive to install, and it can only last one crop because to rewind it becomes too expensive and its cracks and twists can be a shelter for pathogens, so in most cases USDA regulation require only new raffia to be used in each cycle. 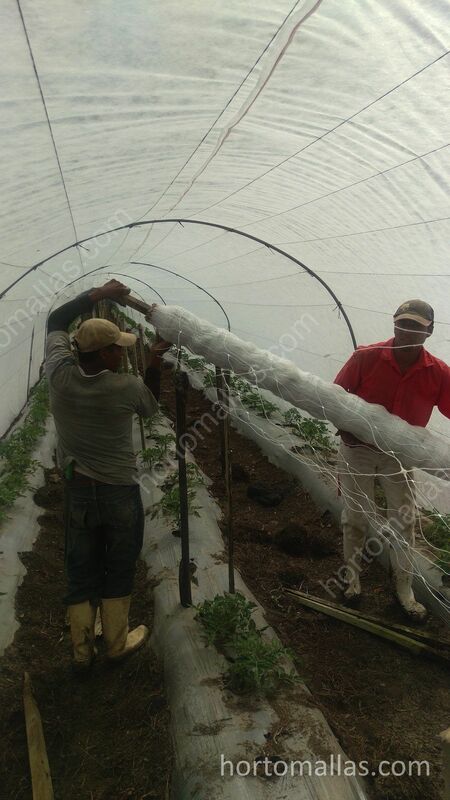 A Tutor trellising system made out of raffia can collapse in its entirety if one cuts accidentally one of the weaves. So it is literally like walking the high wire… as you never know until when it will work. Sticks and poles as training devices will be very expensive and attract pathogens. 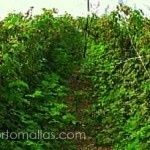 Just like the tepee trellising system, this method of training plants upwards has its toll on forests and might be looked down by local authorities. Plants are attached to individual posts driven into the ground on the side of each plant. The fastening is done with raffia or any sort of twists ties. 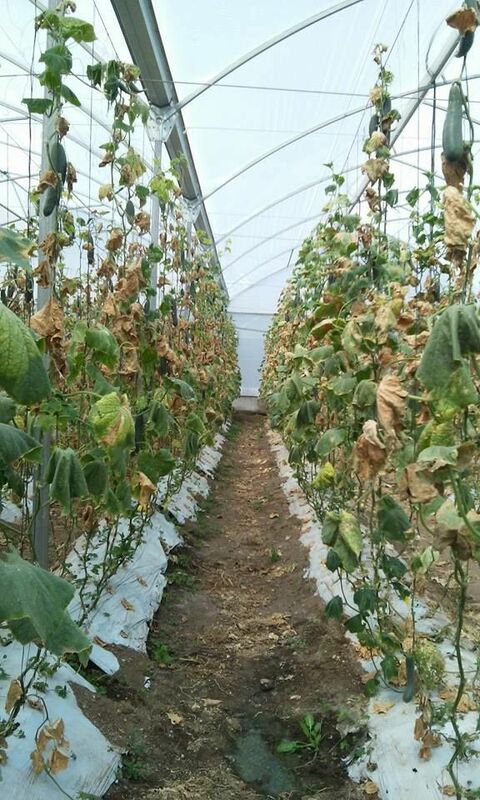 Phytosanity is low as each post can come with diseases from previous crops. Definitely not recommended for professional horticulturists. 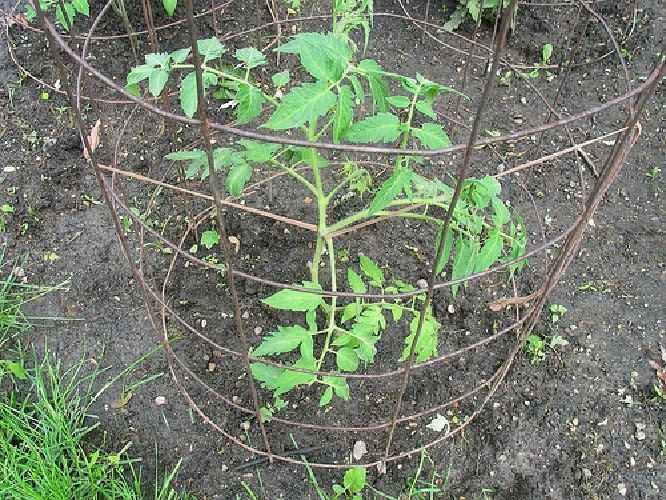 More than anything plant/tomato cages are for the home gardener. 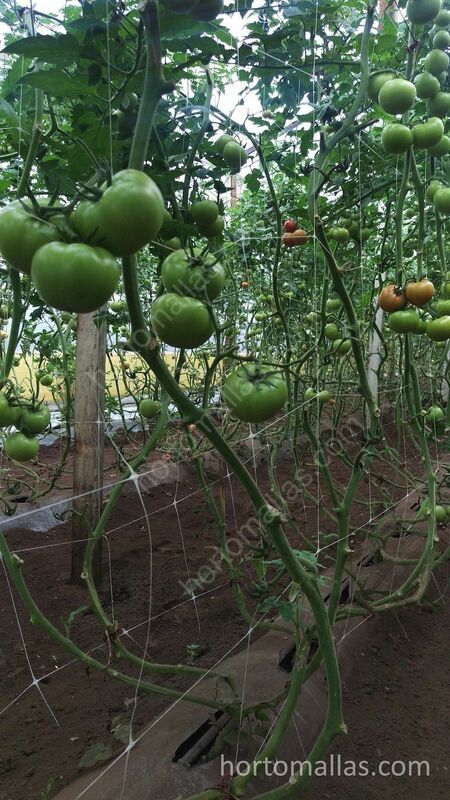 They are very expensive to be even considered as a viable instrument and trellising system for professional farmers. They come in a variety of shapes and forms, mostly to decor the home garden. 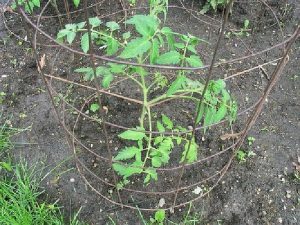 In the picture this piece of welded concrete reinforcement turned into a tomato cage for tomato support. 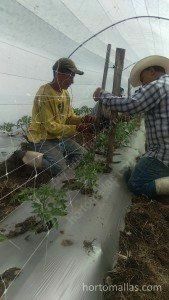 Of all the methods of tutoring and training plants, trellis netting (or vegetable support net) is the most innovative and cost effective for professional growers. Its meshes act as support for the loaded branches of many species of vegetables, whether tomatoes, peppers or cucumbers or melons. 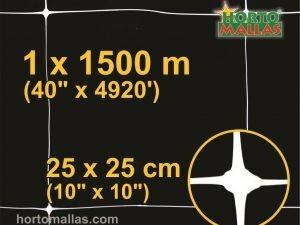 HORTOMALLAS is aseptic and reusable, and it allows plants to grow organically through its meshes, leaning the loaded branches on the horizontal lines without any human intervention. 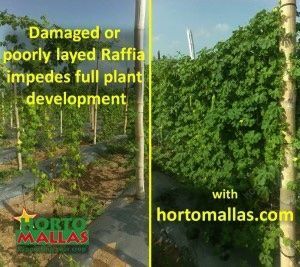 HORTOMALLAS can be installed in about 25% of the time required for raffia nad will be good for 2 or 3 crops besides the initial one. Installed as a double wall of netting, HORTOMALLAS reduces almost completely the need for tutoring by hand thereby reducing the rate of mechanically transmitted diseases. Trellising system and cane density treatments were applied to vigorous raspberry (Rubus idaeus L.) cv. Titan plants in S. Ontario to determine their effects on yield, yield potential, and canopy microclimate during the 1997 and 1998 seasons. 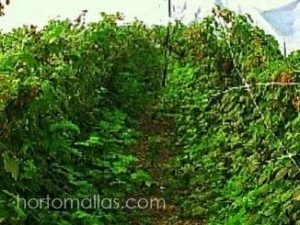 The trellising treatments compared were hedgerow (control), V-trellis, and single-sided shift-trellis (shift-trellis) Cane densities (9, 16, 23, and 30 canes/m2) were established before budbreak each season. 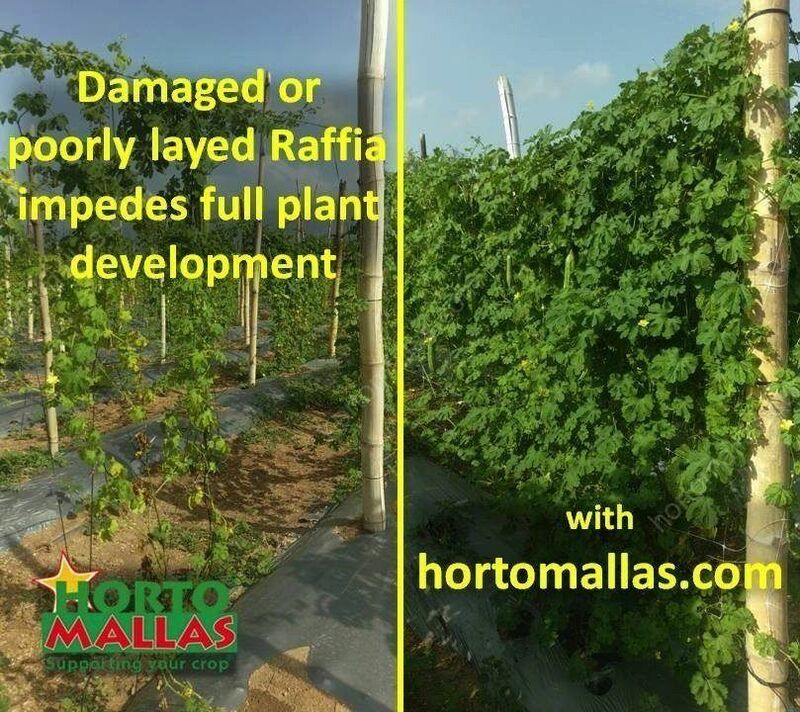 The treatments significantly affected yield and yield components. 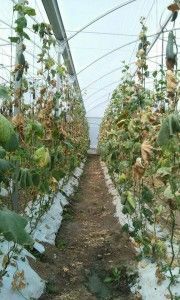 Path analysis indicated that interrelationships among yield components were significantly affected by trellising system. 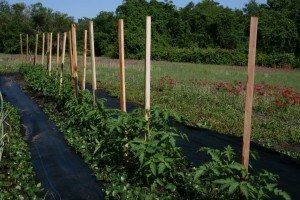 In the second season, plants trained on the V-trellis yielded more than did those in a hedgerow system, while those trained on a shift-trellis had the lowest yield because of a smaller fruiting framework. Fruit quality was lower on the shifttrellis than in the other two systems. These differences were related to light penetration into the three canopies. While an optimum cane density was not found for any system, the maximum cane density (30 canes/m2) produced the highest yields. Yield potential per cane decreased as cane density increased; however, the increase in cane number compensated for this decrease, resulting in an increase in total yield per unit area. Fruit quality also decreased as cane density increased, but cane density did not affect canopy microclimate.